Some 500 years before Christ, Babylon near modern-day Baghdad was a bustling centre. It is often referred to as the cradle of human civilisation. King Nebuchadnezzar, after conquering Jerusalem, built a city of unprecedented charm complete with sturdy fortresses, moat, drawbridges, temple of Baal, tower of Babel and of course the Hanging Gardens, one of the seven ancient wonders. It was sheer technology, way ahead of its times, that created these monuments. And ironically, technology is again playing a crucial role in Iraq, this time in its destruction. War and technology go arm-in-arm. The invention of gunpowder was responsible for the colonial ambitions of Britain. The U2 boats, torpedoes and the flying bombers stoked the Third Reich’s expansionist ambitions. And technology is once more in the limelight with Operation Iraqi Freedom, the satellite-guided Cruise and Tomahawk missiles, the Joint Direct Munitions (JDM)s, and the works. From the 1991 Gulf War to Gulf War-II, there has been a distinctive shift in the way the wars are waged, a shift in favour of technology. Not only have weapons evolved in terms of destructive power, they are also smart now. For instance, Cruise missiles can hover around the target for an hour or so, waiting for a ’go’ from the command centre. The whole operation is being run from thousand of miles away in Virginia, US and Bahrain. War is a logistics nightmare and technology comes to its aid. With the help of technology, there is much better co-ordination of the allied force, notwithstanding cases of ‘friendly fire’. It is now possible to manage and employ a variety of means of invasion — B-52 bombers flying down from the UK, Stealth bombers flying in from Diego Garcia, Apache helicopters from Kuwait, and missiles being fired from aircraft carriers in the Persian Gulf. All this is due to the intensive computerisation programme undertaken by the US defence department. There has been a seamless integration of sensors, communication devices and the weaponry systems in a single network. And this is the difference between the Gulf War in 1991 and the current one. Any war is waged in three stages: surveillance, target acquisition and destruction. Spy satellites, UAVs (unmanned aerial vehicle), AWACS have been hovering over the Gulf region for ages now. The command centre has created a databank of targets like Saddam’s palaces, Ba’ath party’s offices, running into thousands, and every strike is collated with the data bank. Even the missile path for each Cruise and Tomahawk missile is charted on a computer keeping in mind the shortest possible route, traditional airline fly path and even high-rise buildings. The other important aspect is target acquisition. In 1991, Saddam could fire Scud missiles at Tel Aviv, Israel, with impunity from mobile launchers as it would take hours for the allied forces to precisely pinpoint where it was launched from and then destroy it. But, now, with the AWACS hovering at 35,000 feet over Iraq, it is a matter of minutes before the launcher is located, and its coordinates sent to the nearest F-16 fighter jet on a sortie. This has been made possible due to the new approach of the US defence sector – the way it is embracing proven and cheaper technology. Pre-1991, the establishment went in for exclusive and tailor-made systems. But now, they are adopting, cheaper and proven technology off the shelf. “Operation Iraqi Freedom will change the way wars will be fought in the future. This kind of precision is unassailable, striking a target while buildings on either side are spared. In fact, I feel, it is the best advertisement for American armament manufacturers. No wonder they refer to the bombardment as ‘Shock ’n Awe’. 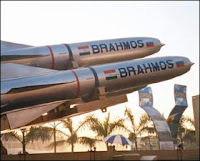 These weapons are way ahead of their counterparts, even advanced nations like France, the UK and Russia cannot match the weapon systems of the Americans,” quips Jane Defence Weekly’s correspondent Rahul Bedi. But technology comes at a cost. The precision munitions are as much as 30 times costlier than the ‘dumb’ munitions, but by virtue of their being accurate, they curtail the need for heavy bombardment. The war has spilled over the World Wide Web too. During the previous Gulf War, Internet was at a nascent stage. Today, it is uniting people across geographies for and against the war. Blogs have become a major source of information. Take for instance, the blog by a supposed American soldier Smash (http://www.lt-smash.us/) reporting from the front. On the other hand, there is Salam Pax (http://www.dear—raed.blogspot.com/), a resident of Baghdad, who provides an insight into these turbulent times. Scores of US websites have been defaced by anti-war protesters, while pro-war hackers have ensured that Al Jazeera’s English site (http://www.english.aljazeera.net/) does not run at all. But as the battle reaches the urban landscape of Baghdad, the technological edge enjoyed by the allied forces may get more or less nullified, feel analysts. The Republican Guards are more atuned to the weather conditions and the terrain, and then it will be a victory of the fittest. A centimetre off-track on a computer becomes miles on the field. As the old military man says, you can batter the enemy with missiles, but you still need a man to fight the battle.